End the world with boulders! 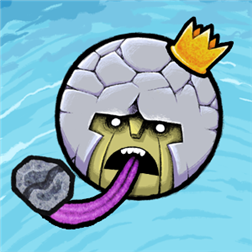 King Oddball swings a boulder back and forth with his tongue. Release it by tapping the screen. Time the release accurately and crush as many targets as possible with each boulder. Simple but addicting! Gain extra boulders when crushing three or more targets with a single throw. Master the game by anticipating how the boulders roll, bounce, and launch from explosions. Take advantage of collapsing structures too! – Single tap gameplay: easy to learn! – More than 120 levels + secrets!